Firefly: Out to the Black is a quick card game that plays from three to five players. It’s unusual in that the players do not compete against each other, but compete against the game. This is a fairly new style of game called a co-op game or cooperative game. Players take on roles of the crew of Serenity and play through a series of Events. Using their Fightin’, Flyin’, and Thinkin’ skills they attempt to successfully complete these Events to earn Credits and Honor. If the players run out of Credits or Honor before the end of the game, they all lose and the game wins! If the players manage to complete the predetermined amount of Events without running out of Credits or Honor, they win the game, and live to fly another day! Event Cards – These are the Events the players must overcome to win the game. Serenity Cards – These are dual use cards. The main use is to help the players overcome Events. It’s secondary use is to determine random numbers. Alliance Cards – These are penalty cards that are drawn if the players do not do well at certain Events. Draw too many of these and the players lose the game even if they still have Credits and Honor. Gorramit Cards – These cards modify the Events, generally making them harder. A Set of Rules – The rules to the game. Honor Tokens – These are used to track the player’s Honor. Credit Tokens – These are used to track the player’s Credits. The Character Cards each represent one of the main Characters in Firefly. In addition to having their skills values listed, Each Character has special abilities, which cost a variable amount of Credits or Honor. On a players turn he can choose to spend Credits or Honor on one of these abilities, but it brings them closer to losing, so they need to think about whether they really need to or not. A typical turn of the game consists of the active player turning over the top Event card. Each Event card has three challenges, one Fightin’, one Flyin’, and one Thinkin’. Each of these has a number, which the players must equal or exceed to be successful in the challenge. Characters gain skill two different ways, they may play Serenity cards to gain skill, and, after playing their Serenity cards, they add a random number to determine their final skill. This is added to the Character’s base skill number listed on their Character cards. Depending on how many challenges they successfully complete they either gain or lose Credits and/or Honor. The more successful the more they gain. Once the event is resolved, the next player starts a new turn, and turns over the next Event card. The game is over once all the Event cards have been drawn and resolved. The Firefly TV show is about surviving with honor. Mal and his crew are continually trying to scrounge up enough credits to keep flying, while maintaining their own personal sense of honor. The game reflects this grand theme with the victory conditions, survive the Event deck without running out of Honor or Credits. Each Event in the deck is tied to an episode in the show, and is easily recognizable by fans of the show. The Skills needed for each Event are tied to action of the episode featured on the card. 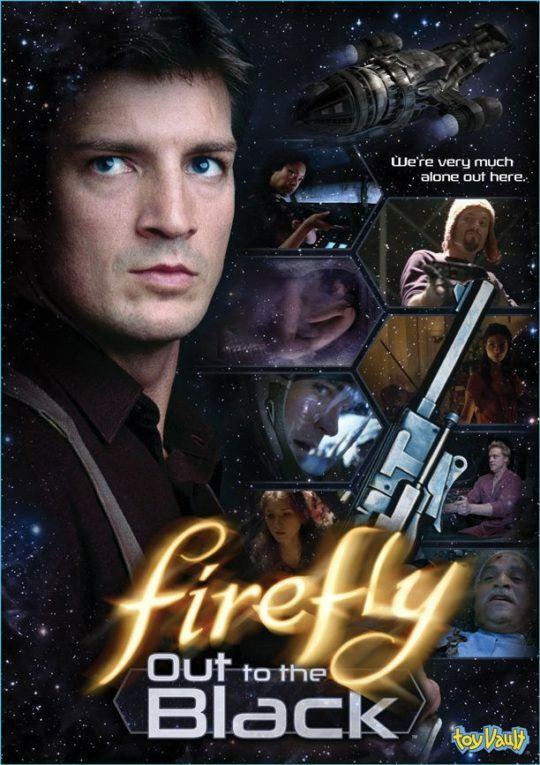 A sub theme of the show is escaping notice of the Alliance, and again, with the inclusion of the Alliance deck, Firefly: Out to the Black delivers. The Alliance deck is an ever-present threat looming over the players as they desperately seek to finish the Events in the game.